A speeding ticket is a form of traffic ticket that is given to motorists who travel faster than the allotted speed limit. Traffic tickets are notices issued by law enforcement officers or officials to motorists or other users. Traffic tickets formally accuse motorists of committing a traffic violation. In general, a traffic ticket comes in two forms—they will either cite a moving violation (including speeding tickets) or non-moving violations, such as parking infractions. Speeding tickets will be given to individual motorists if they travel beyond the speeding limit. Speeding limits will range depending on jurisdiction and the type of road the motorist is traveling on. For instance, on highways or major roadways the average speed limit is 65 miles per hour. In residential areas, the speed limit will be significantly lower, often times between the ranges of 25 to 45 miles per hour. Regardless of the location, if a motorist is caught travelling above this limit he or she will be pulled over and given a speeding ticket. All jurisdictions will post speed limits for given roads via traffic signs. These signs are universal; they will list the speed limit in large bold lettering with the phrase “speed limit” listed above. Speeding tickets are given to motorists by local, county or state police officers. 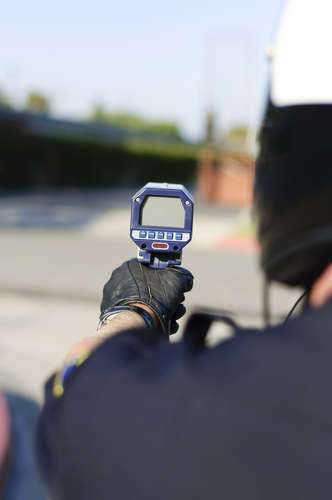 It is up to the discretion of these law enforcement officers to administer speeding tickets to motorists who are in violation of the jurisdiction’s laws. Typically, law enforcement officers will only administer speeding tickets for egregious or aggressive violations of the speed limit. In this sense, law enforcement officers, will pull-over motorists for travelling at least 10 miles over the allotted speed limit. Regardless of this leeway, it is important to stay at or below the speeding limit when driving. Speeding tickets are always attached with a fine. This fine will vary based on the severity of the violation. If the motorist is travelling only 5 to 10 miles above the legal limit, their ticket will be attached with the minimum fine. If the motorist is travelling above 25 miles per hour above the limit this fine will likely increase; any flagrant violation of the speed limit will result in an exorbitant fine and perhaps additional penalties, such as a suspension of the operator’s driver’s license. Additionally, a motorist will susceptible to increased penalties if the individual has committed similar offenses in the past. Similar to other traffic laws or DUI laws, multiple offenses will yield additional penalties. What are my Options if I’m given a Speeding Ticket? In the United States, the majority of traffic laws are codified in various ways by state, county or municipal laws. Each state’s Department of Motor Vehicles will maintain a database of motorists and their coordinating traffic violations. When a motorist is given a speeding ticket, the individual will be given the option to mail the ticket—with its coordinating payment—to the local court system or the court for the jurisdiction in which the traffic violation took place. On the speeding ticket, the motorist must check—in the appropriate box—whether they wish to contest the ticket or plead guilty. A plea of guilty will require the motorist to submit a payment for the satisfaction of the fine. The response to the speeding ticket must be prompt—a failure to respond to speeding tickets will result in additional penalties. If the motorist wishes to contest a speeding ticket, a hearing will be set by the Court upon the request. These traffic hearings are heard before a judge or magistrate depending on the city or state. These hearings may be continued and witnesses or the issuing police officer may be subpoenaed. At any point during the traffic court, the motorist may retain a legal professional to represent him/her in traffic court. Consulting with a traffic lawyer may prove beneficial to the motorist because these legal professionals understand how to contest speeding tickets in the given state, county or town. Motorists will typically schedule the hearing for a time at which the issuing police officer is likely to attend. If the law enforcement officer or representative responsible for the ticket fails to attend, the court judge will typically dismiss the charge. Because of the local laws attached to speeding tickets, each judge, state, county or municipality will handle traffic cases a tad differently. If the motorist wishes to plead guilty to the speeding ticket and the fines attached, the outcome will be equivalent to a conviction following the hearing. Upon conviction, the motorist will be fined a monetary sum and an additional penalty referred to as “points.” This penalty is distributed differently based on state law; however, all point systems are employed to chart a motorist’s driving history. If a motorist is convicted of speeding in a different state than the one he or she is registered, individual agreements between the states will decide if, and how, the driver’s home state applies the other state’s charges. If an agreement does not exist, the conviction will be applied locally to the state where the speeding infraction took place. A point system is one where a police force or a Department of Motor Vehicles issues cumulative penalties or points to motorists following a conviction for violating traffic laws. Speeding tickets are one way to accumulate points; the more points a motorist has on his or her driving record the more the individual will be fined for subsequent traffic violations. Points may be either added or subtracted from one’s driving record. Major offenses will lead to more severe penalties; egregious violations of traffic laws will result in hefty fines and multiple points. Points are applied after the traffic violation is committed and cancelled following a defined length of time, typically a few years. If the motorist accumulates a specified amount of points he or she may be disqualified from driving for a set length of time. Fines and other penalties will be applied additionally, either for a violation or after a certain number of paints has been accumulated by the motorist. The purpose of the point system is to identify, deter and subsequently penalize repeat offenders of traffic law. By doing this, the point system ultimately streamlines the legal process. The point system in the United States is implemented on a state level. Because of this localized structure, the point system will be applied in a variety of ways—or not at all—depending on the state. Aspects of a motorist’s driving record will be reported to their respective insurance companies, who will use them in determining rates and fees to charge. Insurance companies will also evaluate motorist driving records to decide whether or not to renew or cancel the respective insurance policy. Negligent drivers will be placed on probation for one year (6 months of their probation will be applied with a suspension of their driver’s license). When the suspension or revocation ends, the driver is required to re-apply for a license to legally drive in the state. • Failure to stop the vehicle as required when signaled at a railway grade crossing. If a driver is cited for speeding or another traffic violation, the presiding judge may offer the motorist the opportunity to attend Traffic Violator School. This alternative penalty is delivered as a form of rehabilitation for the motorist. A driver will have to participate in these schools for a period of 18 months for the offenses to be formally expunged. Whenever a citation for a speeding ticket is dismissed, the record of citation is forever removed and no more points will accumulate.